#Multibagger stock – Long term fundamental idea – Research report. Mr. Radhakishan Damani, one of the renowned investors and visionary businessman founded Avenue Supermarts Ltd. (ASL) in the year 2000 as a Private company which later converted into a Public Company in the year 2011. The Company came out with a Public issue for raising 1870 crore Rupees from securities market in early 2017. The issue remained open from 08/03/2017 to 10/03/2017 with Price Band of Rs. 295 to Rs. 299. The Issue got subscribed 73.41 times leading to its Issue Price being fixed at Rs. 299. The Shares got listed in BSE and NSE on 21/03/2017 at Rs. 604.40 which is 102.14% above Issue Price. The company operates under the brand name “D’mart”. It is an emerging national supermarket chain, with a strong focus on value-retailing. Company is having its headquarters in Mumbai. It opened its first D’Mart store in 2002.Till 2008 the Company had only 10 stores, However, currently the Company has over 140 stores spread across Maharashtra, Andhra Pradesh, Telangana, Gujarat, Madhya Pradesh, Chhattisgarh, Rajasthan, National Capital Region, Tamil Nadu, Karnataka and Punjab. Maharashtra and Gujarat. At present Company is operating its business throughout 10 states and 1 Union Territory Company have 23 distribution centres and 5 packing centres in Maharashtra, Gujarat, Telangana and Karnataka. The Company offers an extensive range of products which are classified into three major categories – foods which includes staples, groceries, fruits & vegetables, snacks & processed foods, dairy & frozen products, beverages, and confectionery, non-foods (FMCG) includes home care products, personal care and toiletries, and other over-the-counter products and general merchandise & apparel includes bed & bath, toys & games, crockery, plastic goods, garments, footwear, utensils and home appliances. In FY17, foods business contributed 54% of the total revenue, non-foods business contributed 20% and general merchandise & apparel contributed 26% of the revenue. Company’s business model is based on the concept of offering value retailing to customers using the campaign of “Everyday Low Cost/Everyday Low Price”. Company reported robust revenue growth of 39% YoY in FY 2016-17. Same performance can be expected for next few years considering the Indian consumption story and strong market and brand presence of the Company in India. After the introduction of GST, the growth in organised retail sector and FMCG sector is expected to remain high. Considering this just a start for a huge consumption ask for a nation as bigger as India, company promises lots of potential to grow and make the best out of consumer friendly environment and having a direct access to one of the biggest consumer base in India. In India, private consumption constitutes about 60% of India’s GDP, of which retail contributes around 50%. Organised Retail was 9% of total retail in FY 2016 and is expected to touch 12% by FY 2020. During Q3 of FY18 the Company’s total income on Standalone basis was Rs. 4094.84 crores compared to last quarter Rs. 3508.27 crores, registering growth of 16.72% on QoQ basis. The Company has earned Standalone Net Profit of Rs. 251.76 crores. Company is still to explore huge potential market in North India. During FY 17 Company successfully closed its Initial Public Offering (IPO). The IPO of 62,541,806 Equity Shares was offered to investors at a price of Rs.299 per share aggregating to Rs. 1,870 crores. The proceeds of the issue are being utilised for repayment or pre-payment of term loans and redemption or early redemption of Non- Convertible Debentures of the Company, for Construction and purchase of fit outs for new stores and General Corporate Purposes. CRISIL has upgraded the Company’s rating on the long-term bank facilities and non-convertible debentures to ‘CRISIL AA/Stable’ from ‘CRISIL AA-/Positive’. Company is expecting growth of 30% ~ 40% for next 5 years. If it manages to grow at 30% CAGR only still stakeholders should get good return over the next few years however, anything over it would be absolute bonus. 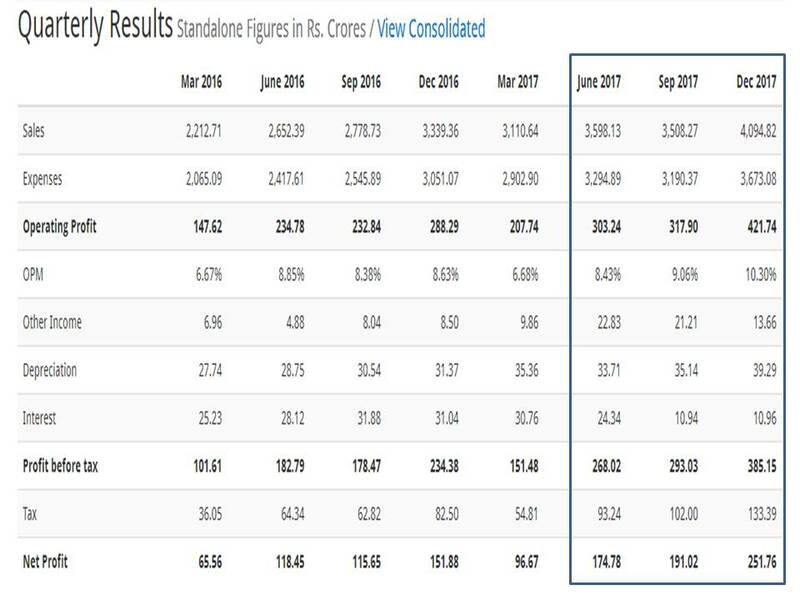 There are only few companies in India who produce this kind of growth in their business and considering future prospect this may turn out to be a very good company in long run.